Are you really paying attention to what you’re reading, or is it just the “illusion of attention?” Are you merely going through the motions, in effect sleepwalking all day long? Can not paying attention cause you to lose money? Imagine that you are playing a game of chess. You look intently at the board and see all the chess pieces laid out clearly in front of you. You’re absolutely sure you know what’s going to happen in the next move or two because it all looks so obvious. Then, out of nowhere, your opponent surprises you with an unexpected move. How could he surprise you if you were paying such close attention to the board? The reason for this is what psychologists refer to as the “illusion of attention.” It occurs when people believe that they see an entire scene, but they actually miss what’s right in front of their eyes. 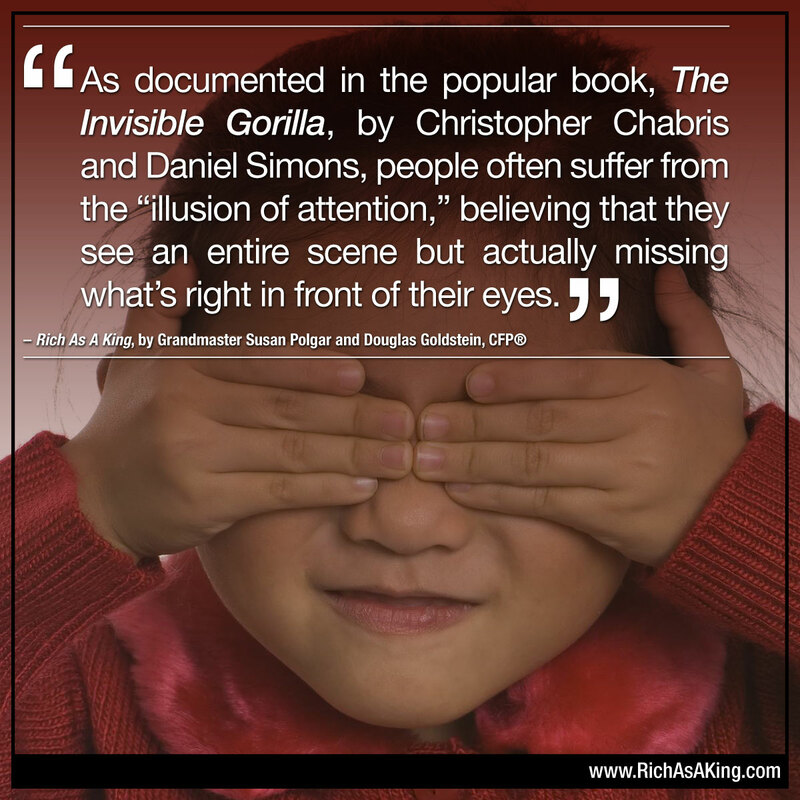 Cognitive psychologists Christopher Chabris and Daniel Simons wrote about the illusion of attention in The Invisible Gorilla. Many people suffer from this phenomenon, including experts and individuals in positions of responsibility. Among the examples that Chabris and Simons give in their book are an experienced airline pilot who did not see a plane on the runway where he was about to land, and a veteran nuclear submarine captain who could not see a 200-foot fishing boat that was right in the middle of his periscope view screen. Why do you miss important details? One of the main reasons why you don’t see important details, though they may be right in front of you, is because you simply don’t expect them to be there. Even if your financial advisor provided you with a summary of your entire financial picture, you may miss certain details because you did not expect to find them there. As a result, you can end up paying a heavy financial price for what you didn’t see. What’s the best way to stay on top of your financial situation without making unexpected mistakes? Don’t rely on your own personal judgment alone. Get an extra set of eyes to review your statements. Sit with your spouse, trusted friend or family member, or better yet, a professional advisor, to review your entire situation. Having an objective viewer offer insights helps to ensure that you don’t miss a crucial element on your money board. Want to find out more about the illusion of attention? Click here for some short videos about Chabris’ and Simons’ research.